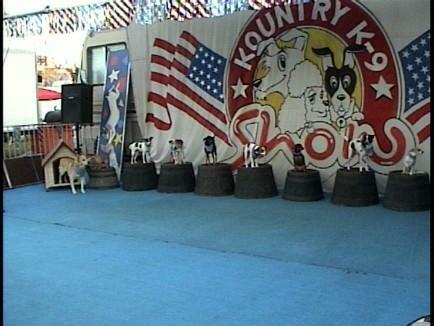 This twenty-five minute action packed kountry k-9 show will entertain the child in all of us with their unusual capers and antics.Watch them as they jumprope,ride skate boards,go down a slide forward and backward,walk on thier front feet and walk forward and backwords on a whiskey barrel,and a whole lot more! This Kountry k-9 Show is fully self contained,licensed and insuranced. This show is definitely a crowd pleaser!